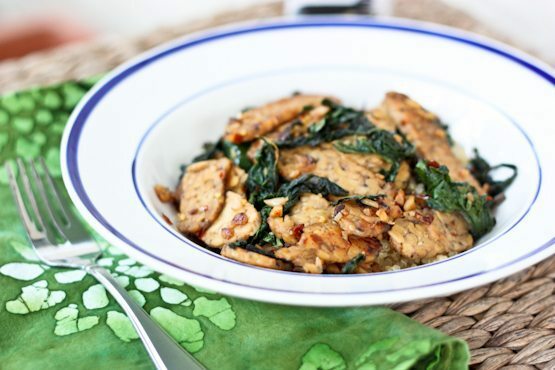 A flavorful one skillet meal with tempeh, sautéed kale and coconut aminos. I don’t know about you, but I’m always pretty hungry when I come home from work. This means that dinner can’t take longer than 45 minutes or I’ll have raided the pantry and stuffed myself with way too much “snacks” before dinner is even done. I try my best not to fall into this habit and I’ve found that as long as I stick with meals that don’t take a lot of prep work, it’s not too difficult. The meal I’m sharing today is one of those easy peasy weeknight meals that comes together quickly. It doesn’t require a ton of ingredients, everything is simply tossed into one skillet and it comes out tasting great. It’s got protein, dark leafy greens (my fav!) and whole grains = aka the winning combo. 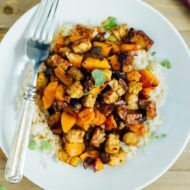 You’ll love the warm, hearty flavors, especially during the cooler fall and winter months. It’s healthy comfort food! Meals like this make me smile. 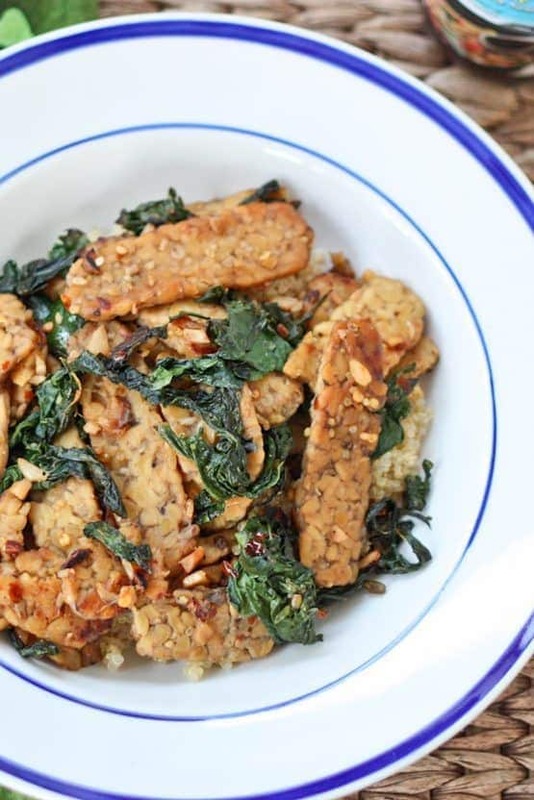 And don’t be scared away by the tempeh. It doesn’t need to be marinated or steamed beforehand, yet it still tastes quite lovely. 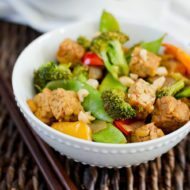 <– This is coming from a lady who used to shun away from cooking tempeh at home because it never turned out right and always had a bitter aftertaste. In large skillet over low heat, combine the coconut oil, red pepper flakes, garlic and ginger. Cook slowly, taking care not to brown the garlic and stirring occasionally for 5-7 minutes. While the garlic is cooking, whisk together the coconut aminos, maple syrup and water in a small bowl. 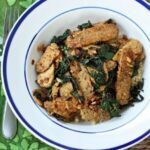 Increase the temperature under the skillet to medium-high and add the mushrooms and tempeh. Gently stir to get them coated. Add the coconut amino mixture and stir again to coat. Cook for a minute or two, then add the kale. Stir and cover. Cook for about 3 minutes. Uncover, turn the heat up even more, and cook until the tempeh starts to brown. If you need to add more water to prevent sticking, add 1 tablespoon at a time. Remove from heat and stir in the black pepper. Taste, add more pepper if you like, and serve immediately over quinoa or brown rice. Adapted from Black Pepper Tempeh from Super Natural Every Day by Heidi Swanson. 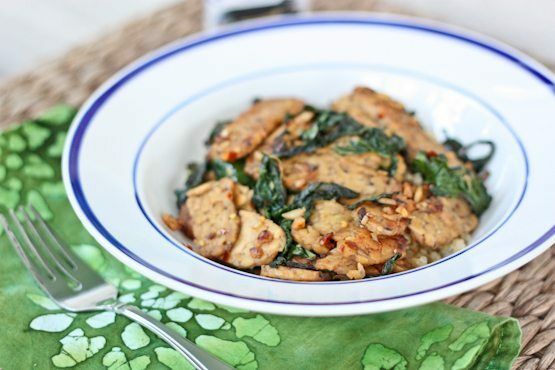 One of the star ingredients in this dish (besides the tempeh and kale) is Coconut Secret Coconut Aminos. It’s a new condiment I found at Whole Foods that I’ve started using in place of soy sauce and Bragg’s Liquid Aminos. It’s made out of coconut sap and sea salt and has less sodium than soy sauce, tamari and Bragg’s. 1 teaspoon of Coconut Aminos has 113 mg of sodium, whereas regular soy sauce and Bragg’s Aminos have about 320 mg in 1 teaspoon. It’s also soy free, raw, gluten free (soy sauce isn’t), vegan, organic and contains 17 amino acids, the building blocks of protein. I wouldn’t mind because I like the flavor of coconut, but it doesn’t taste like coconut to me – I can’t tell the difference between it and Bragg’s or tamari in recipes. Have a wonderful Friday and happy weekend! 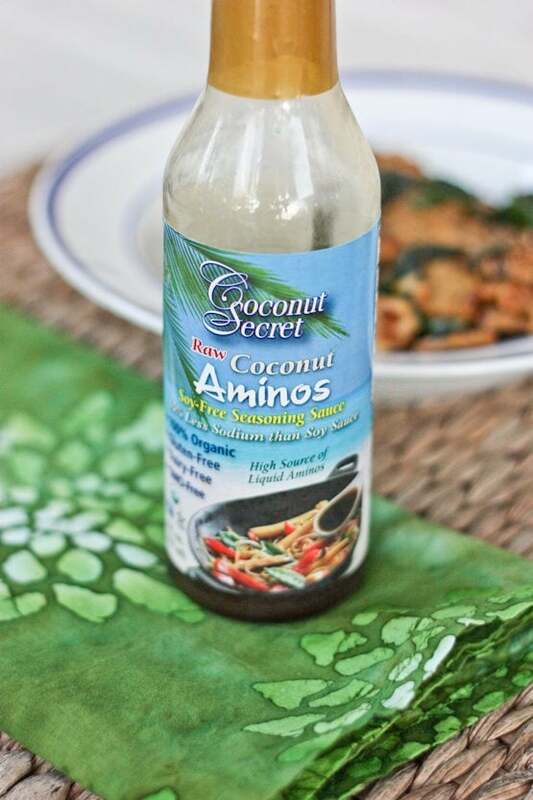 So cool about the coconut aminos–coconut is turning out to be quite the wonder food, isn’t it? Love this dish–looks so hearty & filling. Yes!! I’m in love with coconut! 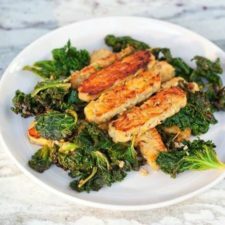 I <3 kale and this dish looks great. I will have to try it out, and also get on the coconut amines bandwagon! Yum! This looks so good (and healthy)! I can’t wait to have some tempeh when I get back to the US; soy products are pretty much unheard of in Russia. I have a pantry raiding problem as well. I usually don’t get home from work until 7 or 8pm so by then my stomach is growling! This meal looks delicious! Made this tonight but added brussel sprouts! Yum! Thanks for the recipe. So glad you liked it. I bet brussels sprouts were a great addition. Totally trying this! I am a tempah convert! Made this tonight for my non-vegan parents and added an extra bunch of kale, they loved it and so did I! Thank you! So glad that you all liked it! Thanks for coming back to comment/let me know how it turned out. I know it’s been two years, but I did a search for “tempeh and kale recipes” and landed here. Wow, this was fantastic! I had to make several modifications for what I had on hand: white mushrooms instead of shitake, hot sauce instead of red pepper flakes, green kale instead of laminate kale. I had to get creative with the lack of coconut amines so I threw some coconut cream powder in with some soy sauce. I also added a fistful of spinach as it was about to go bad. I served it over buckwheat soba noodles. Loved the results! I can hardly wait to make this again with the “correct” ingredients. Yay! So glad that you liked this dish. It’s one of my favs. I just made this tonight, and it was so unbelievably awesome. At Whole Foods, they didn’t know what laminate kale was, so I used instead “lacinato kale” — which the produce guy thought is what I wanted, and maybe had it misspelled. Anyhow, it worked out just fine. Awesome dish! Made this tonight (with curly kale instead of lacinto, and thinly sliced rutabaga instead of mushrooms, as it’s what I had on hand) and it was delicious! I couldn’t stop sneaking tastes from the pan :). Yay! So glad that you enjoyed it, Kia! !